Guerin, Thomas Leroy -- Age 72, of Waterford, died January 30, 2019. No public services will be held. Services will be held later at Great Lakes National Cemetery, Holly. Arrangements provided by Sharp Funeral Home & Cremation Center, 6063 Fenton Rd., Flint. Thomas was born June 18, 1946 in Pontiac the son of Duane and Frances (Sutton) Guerin. He married Sangad "Att" Butsaen on August 14, 1968. 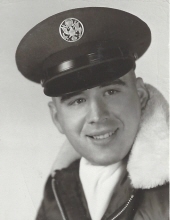 He was a Veteran of the U.S. Air Force. He retired from GM Truck and Bus and the Oakland County Sheriffs Department Marine Division. Thomas enjoyed fishing and golfing. He is survived by his wife of 51 years, Sangad "Att"; daughter, Tonia (Brent) Shortt of Grand Blanc. He was preceded in death by his parents. Tributes may be shared at www.sharpfuneralhomes.com. To send flowers or a remembrance gift to the family of Thomas Leroy Guerin, please visit our Tribute Store. "Email Address" would like to share the life celebration of Thomas Leroy Guerin. Click on the "link" to go to share a favorite memory or leave a condolence message for the family.